Many preschoolers are fascinated with fire trucks and firefighters. Many craft, dramatic play and language activities are available for a full week of activities on these community helpers and their mode of transportation. Science activities are harder to find, and you may have to stretch your lesson plan to include science activities for fire trucks. Point out the hoses on a fire truck and explain to children the reasons the hoses are there. To highlight the need for cool water on a fire truck, try this simple sensory activity. Place several rocks in the sun and allow them to absorb some heat. Fill your sensory table with cool water and immerse the rocks in the water after allowing children to handle them while they were warm. Discuss the changes the children can feel between the warm rocks and the wet rocks. Use this as a springboard to discussing the importance of hoses on a fire truck. Find several pictures of items that may be included in a fire truck or a fire station and place them in a paper bag. Some pictures you may include could be a fire fighter, a Dalmatian, a fire hose, an axe, a fire pole, gloves, boots and a helmet. Also, include several items that you will NOT find in a fire truck or fire station such as farm animals, a cowboy hat and a fur coat. Give each child in the class a chance to pull a picture from the bag and place it on a chart. Label the chart "On a Fire Truck" and "NOT On a Fire Truck". Display the chart in your classroom and allow children to refer to it when talking about fire trucks. Explain to children that oxygen is something in the air that you breathe, but it is also necessary for fires to continue burning. Also explain that as firefighters go through a burning building, they close the doors behind them each time they move through a room because this cuts down on the amount of oxygen that gets to the fire. Demonstrate this by lighting a candle and then placing a glass over the candle. Within a minute or two, the fire will use up all the oxygen in the glass and go out. Do not allow children to try this experiment on their own. 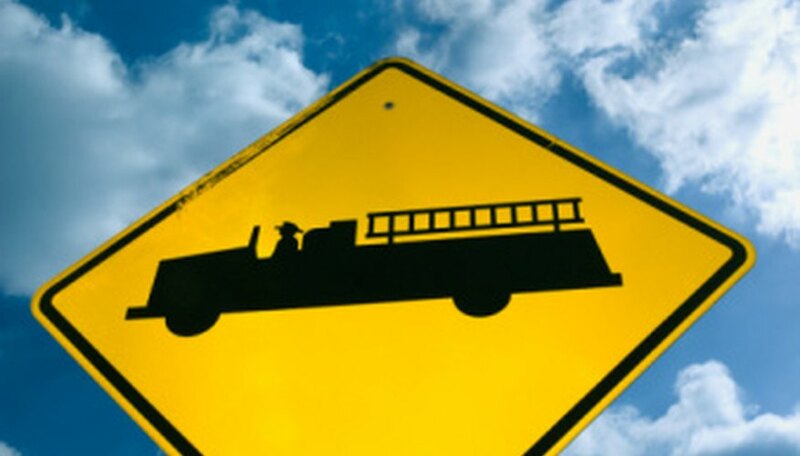 Explain to preschoolers that fire trucks are usually three colors: red, lime green or yellow. Show children that this is because these three colors are the easiest to see in many different kinds of light. Demonstrate visibility by holding up red, lime green, yellow, dark green and dark blue papers while standing across the room from the children and slowly dimming the classroom lights. Ask children which colors they can see best at each light. Leave the colored papers out for children to explore on their own. Bietz, Kara. "Preschool Science Activities for Firetrucks." Sciencing, https://sciencing.com/preschool-science-activities-firetrucks-8307596.html. 25 April 2017.